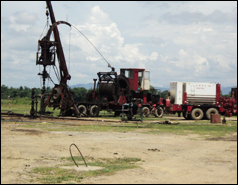 Paraffinic crude oil flows freely at high temperatures through oil wells and pipes and conduits carrying oil; however at below 30°C temperature the paraffinic begins to precipitate out and deposit in oil well tubing and surface flow lines. These deposits keep getting thicker and more complex due to deposition of asphaltenes, paraffins, clay and corrosion products keep adding onto them. Eventually there is a complete blockage of oil pipeline and crude oil stop flowing through these pipelines. Conventional techniques for control of paraffin deposition in the oil pipelines are highly expensive and plagued with other associated problems. Steam, chemicals and solvents are used to dissolve the paraffin deposition are also expensive and environmentally hazardous. Joint research of ONGC, IRS & TERI lead to development of a mesophilic paraffin degrading Bacteria which produce slime materials to attach themselves to the surface of the pipeline, produce slime, divide and produce micro colonies within the slime layer, and construct a Biofilm. This Biofilm does not allow the paraffin present in the oil to get deposited on the surface of the pipeline, thus improving the flow efficiency of the treated pipeline. 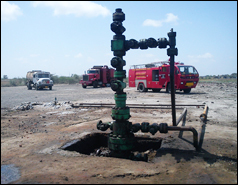 Thus, prevention of paraffins deposition in oil pipelines by using microbes offers a cost effective approach. OTBL has implemented PDB Technology in total of 122 oil wells. The overall success ratio of these jobs has been of the order of 60% which has resulted in more number of line flushing days and increased oil production. The overall success ratio of these jobs has been over 70 % which has resulted in more numbers of line flushing free days and increased the oil production. 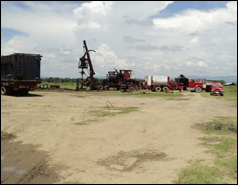 15 WDP jobs awarded to OTBL by ONGC Assam Asset are under various stages of execution. 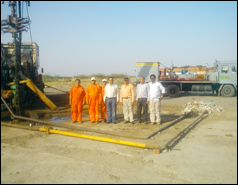 Out of 5 WDP jobs awarded to OTBL by ONGC Ankleshwar Asset, OTBL has field executed 1 jobs in field-B of ONGC Ankleshwar Asset, while with regard to the rest the work is in-progress.